“What’s for lunch?” The question may evoke dread — whether posed by children or adults. It can conjure up memories of cafeteria lines, the necessity to pack something every day, or general malaise toward this midday meal. Yet, while lunch may be an afterthought, in some ways, it can rival breakfast as an important daily meal. One small study published in Diabetologia even suggests that a larger breakfast and lunch regimen may be slightly more beneficial for weight loss than eating six small meals a day for individuals with Type 2 diabetes. Although both groups lost weight, researchers found participants eating larger breakfasts and lunches lost more weight than their counterparts who consumed the same number of calories in six small meals daily. Unfortunately, according to one poll, only about one in five American adults is even taking a lunch break. And when they do eat lunch, many are eating out at least twice a week, according to a 2013 survey. At an average cost of $10 a meal, this totals about $1,000 a year per person for lunch alone. Saving money and improving food selection to help both blood glucose and weight management are two good reasons to refuel midday with a healthy, homemade lunch. Committing to a lunch break and actually packing something healthy every day, however, can seem daunting. It also can lead to a monotonous food routine. To alleviate the boredom, here are some tips to make your next midday meal one to remember. As with other aspects of diabetes self-care, planning is key to reducing costs and improving the quality of your lunch food choices. It takes a commitment to change your lunchtime routine, but it also is important to set yourself and your kitchen up for success, whether you are eating at home or taking lunch with you. Tami Ross, RD, LD, CDE, MLDE, author of What Do I Eat Now? : A Step-by-step Guide to Eating Right with Type 2 Diabetes, emphasizes investing a few minutes in planning meals. “Patients I’ve worked with over the years have shared that it takes only five to 10 minutes to plan five meals,” said Ross. This step, she said, ensures you have the ingredients at home to prepare lunches for the week. It also is a great time to engage your significant other or children in the meal-planning efforts. Simple meal prep tasks such as washing fruits and vegetables, measuring ingredients, and following simple recipes can be done even by elementary-school kids. Allowing family members to help create the menu and delegating tasks can lessen the burden of lunchtime prep and ensure everyone’s food preferences are considered. Ross suggests families keep track of everyone’s favorite lunch menus, which can help cut future planning time. Using dinner leftovers for lunch the next day is not a new concept, but if you cook creatively, you can make that dinner meal into something new. Jackie Newgent, RDN, culinary nutritionist and author of The All-Natural Diabetes Cookbook, suggests intentionally planning to enjoy part of your dinner for lunch the next day, but serving it with lunch-style flair. For example, Newgent suggests revamping bean burrito leftovers into a Mexican-style salad by slicing the burritos and serving them atop leafy greens with a salsa dressing. Repurposing doesn’t have to be just with dinner leftovers. Creative cooks may consider how traditional breakfast foods such as eggs, Canadian bacon, whole-grain English muffins, and even oatmeal can be transformed into a healthy lunch. Not everyone has the time or the interest to sit down for a midday meal. It is important, however, especially if you are taking diabetes medications, to create time to eat something to reduce the risk of hypoglycemia and fuel your body properly. Fortunately, whether you are a traditional lunch eater or a grazer, there are grab-and-go healthy options to help you make better food choices. When packing snacks instead of a traditional lunch, consider options from all the food groups, including fruits, vegetables, whole grains, lean protein, and low-fat dairy or calcium-rich foods. Consider the total caloric intake of all your snack choices to help you continue to meet your weight-loss goal. Newgent recommends a “bar” style lunch for well-balanced snacking. “Serve [or pack] three dips or salads, such as hummus, tzatziki, baba ghanoush, or tabbouleh, in bowls. Pair with a whole-grain pita and sliced cucumbers for dipping.” Whole-food preportioned options such as a small piece of fruit, individual snack packs of baby carrots, nuts, or 1-ounce portions of cheese also can be included in a snack-style lunch. Bento boxes are multi-compartmentalized lunchboxes popular for Japanese cuisine and perfect for packing healthy lunches for adults and children. The compartments provide flexibility for packing components of a balanced meal in a visually appealing, kid-friendly way. Dinner leftovers such as shredded chicken can be packed with a small, whole-grain tortilla or tortilla chips, shredded cheese, lettuce, and salsa for make-your-own nachos or a fajita-style wrap. Bento boxes also can maximize your child’s favorite snacks into a healthy meal. For example, pair your child’s favorite whole-grain crackers with peanut butter, cheese, or meat and add a side of crunchy carrots with dip, sliced berries, or melon and a squeezable yogurt. Older children might appreciate traditional lunch options such as a salad topped with grilled chicken and light ranch dressing, whole-grain pita chips, and their favorite fruit. Or try a new twist on an old favorite, revamping the standard peanut butter and banana sandwich into a peanut butter, strawberry, and banana wrap. Instead of serving the entire wrap, slice it into smaller, bit-sized pieces and pair it with your child’s favorite vegetable and a small drinkable yogurt. Reminders regarding the amount of carbohydrates in specific food items even can be included on the lid of the bento box along with a positive message or funny joke to serve as a teaching tool and a way to connect with your child at school. During fall and winter, you might crave a hot cup of soup or chili at midday. For adults and children who can’t reheat lunch items, insulated thermoses can keep food warm from morning until noon. Following the manufacturer’s instructions for thermos care and food reheating will help ensure your food is hot at lunchtime. Proper heating of food also helps keep it at the appropriate temperature. If you are using a new container for a younger child, demonstrate how to open and close it at home to avoid any mishaps at school. Lunch is a time to recharge. 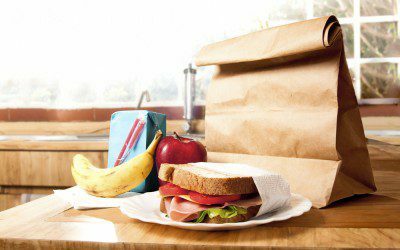 Don’t let this midday meal go by the wayside, and don’t think a boring sack lunch is your only option. Focus on preparing ahead, cooking creatively, maximizing snacks, and using containers to build meals that are nourishing and will help you and your family stay on track with health, weight loss, and blood glucose management goals. Alison Massey is a registered dietitian and certified diabetes educator in Baltimore. She blogs about healthy living and diabetes at www.thesimpleingredient.com.